Did you know this weekend is International Quilting Weekend? I like the idea of a weekend devoted to quilting, although I try to spend a lot of my weekends with my sewing machine. I made this quilt last year, using Soho Solids by Timeless Treasures. The tutorial for the blocks was on their website, and I thought it might be a good idea to share it here as well. There are only two blocks, each based on the classic bear paw block. 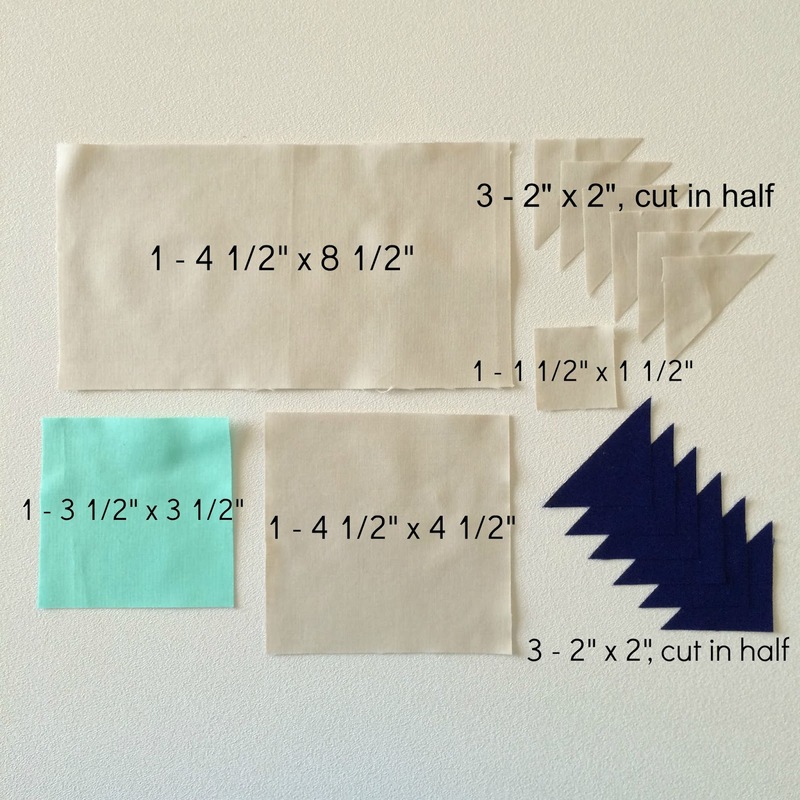 They are simple to make, and the solids give them a lot of visual "pop." Twisting and turning the blocks in different directions will give you lots of design options. I started out with a limited edition fat quarter stack called Plume. I added the following neutrals: 1 1/2 yards each of Fog, Milk, and Linen, and 1 yard of Dove. I decided Dove was a bit too gray so it became part of the backing. The quilt is 48" x 48", and each block is 8" x 8" finished. The extra neutral yardage gave me enough for both the backing and the binding. 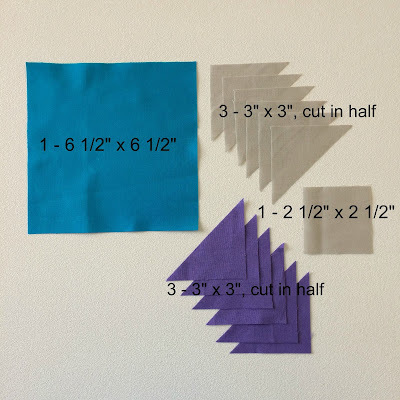 If you would rather not piece the backing, then you will need neutrals totaling approximately 2 yards for the blocks, 3 yards for the backing, and 1/3 yard for the binding. Spray starch (or a starch alternative) onto the back of your fabrics before you cut to help stabilize the bias edge of the half square triangles. For this quilt, I made 27 of Block A and 9 of Block B, but it would certainly be easy to make more or less of either one. For each Block A and Block B, I made a variety of color combinations, mostly two colors with a neutral, and several with one color and a neutral, and even a few with neutrals only. Then just twist and turn the blocks until you find a setting that makes you happy. Sew the blocks into rows, and then sew the rows together. Because of all the sharp points, my machine quilter, Darby Myers of Quilted Squid, used a nice and curvy Baptist Fan design. I hope you enjoy making your own version of Delta Breeze. If you like to binge watch shows while you are sewing, you will want to check out The Quilt Show, which is an online quilting show and magazine all in one. You will be able to access and watch the shows for free from their first seven seasons, and there are prizes to be won! An interesting side note is that each year, Alex and Ricky choose a "quilting legend," someone who has had a great impact on the quilting community over the years. Every year, Mark makes the plaque that is presented to the legend. Each one features the star from The Quilt Show logo, but he customizes the colors to fit the recipient. I'm so proud that his artwork is in the homes of people like Jinny Beyer, Michael Flynn, Libby Lehman, and Alex Anderson herself. In fact, one year Alex and Ricky highlighted his work on the show, and all of the audience members received a pendant. It was pretty awesome. These are our Glassy Quilts. 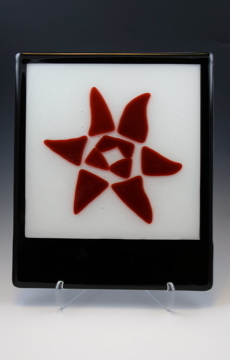 Each one consists of a fused glass "frame" and a handmade 3" quilt block. We no longer make them, but if you are interested, we still have some available. If you make a version of Delta Breeze, one of my favorite quilts from 2015, please let me know--I'd love to see it. And be sure to check out The Quilt Show this weekend. Happy sewing! I love this quilt, it's wonderful! Such a beautiful quilt! Thank you for the tutorial. Very cool about the glasswork! And your quilt? Absolutely beautiful!! It was such fun to see Delta Breeze in person. Thanks for the tutorial. Mark's glass work is beautiful. I've always loved seeing the pieces when you have highlighted them. A very lovely quilt. Thank you for the tutorial, because I gave up looking on their site for the pattern...but found some others I like. I hope some day in the near future I can make it. Your quilt is gorgeous and the tute 8s very helpful. I love this quilt so, so much. And congratulations to Mark on the recognition for his beautiful glass work!